The "hero" son of former England football captain Terry Butcher has died, his family has confirmed. Ex-Army Capt Christopher Butcher, who had served in Afghanistan, died on Monday morning. Announcing the death on Facebook, his younger brother Ed described him as a "hero" and said he was the "best brother" he could have had. "His death has hit the entire family hard," Mr Butcher, who lives in Southampton, added. Capt Butcher, who was 35, had served with the Royal Artillery. 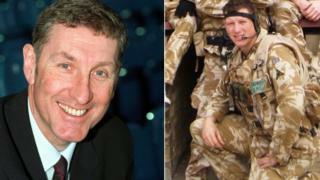 His father, former Ipswich Town and Rangers defender Terry Butcher, who lives in Suffolk, has previously voiced his pride in his son's military service. "The family are together and we will release the dates of the funeral in due time," Ed Butcher said. "We know how greatly he was loved and we're sorry that we can't call every person who knew him to tell them. "Chris you were my hero, you were my best friend and you were someone I would throw myself in the way of a truck for. "This is for you and thank you for everything you ever taught me and I will miss you for the rest of my life but you will never be forgotten." On his Facebook biography, Capt Butcher had written: "Left the Army and now just a moody bitter vet." Ipswich Town, for whom Terry Butcher made more than 250 appearances in the 1970s and 1980s, tweeted: "The thoughts of everyone at #ITFC are with Terry Butcher and his family following the sad news of the passing of his son, Christopher." East Anglian rivals Norwich City said: "Everyone at Norwich City would like to pass on our condolences to Terry Butcher and his family at this sad time."